Mind Scanner will blow your audience away and has HUGE comic potential. ...these were just a few of the audience's comments after Daryl performed this mystery at a private party recently. Imagine, turning any freely selected member of your audience into an instant mind reader! 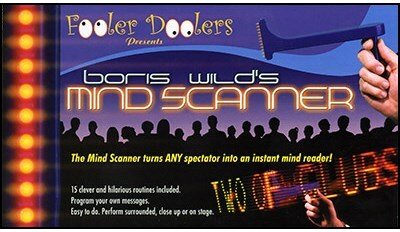 Boris Wild's Mind Scanner is an incredible electronic device that "reads" a thought from a volunteer's mind and then sends that "psychic vibration" to be revealed by ANY member of the audience! A volunteer begins by making a mental selection... this can be any one of an unlimited number of possibilities. Once the volunteer concentrates on his mental impression, the Mind Scanner is activated and it's used to "read" the volunteer's thought. The volunteer then freely selects ANY member of the audience to act as the receiver. With 100% accuracy, this freely selected spectator reads the volunteer's "psychic vibrations" and reveals the mental selection. The volunteer is completely bamboozled and has absolutely NO IDEA how the spectator was able to read his mind! The presentational possibilities are limitless! A few examples of possible mental selections include playing cards, numbers, words from books, magazines or newspaper columns, E.S.P. symbols, objects on the table or from a spectator's pocket or purse, cities anywhere in the world, CDs, DVDs, people (movie stars, sports figures, politicians, etc.) or even the UPC bar codes from any product! Boris Wild's Mind Scanner comes complete with the Mind Scanner prop (batteries included), a very special deck of Bicycle cards to get you started and a twelve page instructional booklet which includes two handlings for the basic routine plus fifteen additional presentations. This entertaining and mind-boggling mystery can be performed close up and surrounded, in a parlour type setting or on stage for thousands. It's a welcome addition to anyone's performing repertoire. Available in either Blue or Red Bicycle Deck. Choice of color not an option.